It is very difficult to get good honest Karate training these days and even more difficult to get good honest Karate training that provides ongoing advancement and inspiration. Karate isn’t just a physical endeavour, it has a deep underlying spiritual element that facilitates and underpins the physical aspect. It is a tool for developing the psyche (soul). Without the correct mindset one will not have the inner fortitude to develop the strong physical mechanisms that give Karate its speed, power and dynamics which are the necessary requisites for the one hit kill. It is not within normal conditioning to already have these built in; these physical mechanisms have to be developed. They are paramount to ones healthy and progressive Karate development. One needs courage and bravery to develop a strong mind as real genuine Karate is not for the faint hearted. The psychological aspect of Karate has its roots in the Zen philosophy. Zen was the religion of the Samurai Warrior class in Japan. I suppose one could say the Samurai turned death into an art form. The Samurai could strike without regret and die without fear, a necessity as a single doubt or fear could cause a lack in concentration that could prove fatal, also having to live with the thought of impending death every day needed a spiritually philosophical strategy. We do not need to be like the Samurai today. We do not need to prepare our minds for death. What we do need however is to prepare our minds to “live”. We need to bring our consciousness out of atrophy and train our minds to fight against our own self doubts and self imposed limitations and become stronger more able individuals. Whilst it is not every student’s ambition to learn the one hit kill, it should be every student’s requirement to develop the skills that will lead onto developing a better standard of living. easy training will not accomplish this and nether will an instructor that’s only interested in student fees because to start building strength into the character means one has to be pushed, challenged and tested and this method of training is not popular amongst the meek and the mild, although it seems these days everybody wants to wear the label of the warrior!!! The commercialisation and profit market for Karate today has misled the majority of its practitioners into believing that what they are practicing is of a genuine nature when in fact it is not. How can it be? With the amount of martial arts schools and instructors out in the world and the amount of people that are training or have trained at some point in their lives, one would think that the majority of nations would be full of strong minded, well balanced, dignified people who are quietly assertive, follow impeccable codes of moral conduct, never give up in the face of adversity and who never compromise their high standards and integrity for the benefit of others, but are willing to pass on and teach others how to attain these standards for themselves (the way of a true Karate-Ka). Imagine a world full of people with these high codes of conduct, wouldn’t that be wonderful? And wouldn’t the world be a wonderful place to live in? The fact that this is not so is evidence that it is all work in progress. It is a day and age whereby Karate and Martial Arts in general has absorbed itself into society creating a wide and diverse spectrum of extremes across the board. The level, ability and knowledge of instructors ranges from below average to exceptional and yes it seems that everybody is “kung -fu fighting”. I was once told by a very inspiring colleague “when the student is ready the Master will come”. If the spectrum and range of Instructors is so extreme in both directions then maybe that is because there is demand for them in these extremes. After all not everyone will have the mental capacity or the fortitude to be trained on a regular basis by a top Instructor because not everyone has that mentality or that certain type of aggression that enables a student to flourish in a martial environment. I like to use physics when I translate my Karate to my ideas and theories. One of the basic laws in physics is “like attracts like” so there is definitely an Instructor out there for every level of human capability from the below average to the exceptional. This inspires a very positive outlook if one is able to view the situation from a slightly different perspective. If almost all people are training in Karate or other Martial Art, those that have been well trained will know that within the training is “The Code” the code that teaches us about ourselves and how to behave correctly. All students/ people have got to start somewhere, even if it is on the bottom rung of the ladder. It is really up to each and every individual student to learn how to step up to the mark and progress forward and upwards and when the student is ready the master will come. Training the psyche (soul) can face one with emotionally painful difficulties. Self doubt and self imposed limitations are inherent in all humans at varying degrees, it is these traits that actually hinder and restrain natural creativity. It is natural inner creativity that gives us our individuality and unique expression. The human disposition is to avoid any kind of pain physical or psychological, so it is very necessary to have a trusted teacher who is capable of pushing a student to the limits. It cannot be stressed enough how important these lesson’s are and how beneficial they are to an individual in the long term. A genuine and knowledgeable Karate Instructor knows this because he himself has had to learn them from his teacher, but many students unfortunately are too shy to be able to make it through to the beneficial stages, which can only materialise inside the mind of the student after they have faced and conquered many of their inner fears, self imposed limitations and doubts, giving them a sense of real well being, strength of character and inner calm. This can be very difficult to attain, though it should be every students ultimate goal to work towards attaining “Self Enlightenment” after all what are we all here for if it isn’t to ultimately realise our full potential and true nature. It is much easier to be tempted into going down the road to the brightly coloured and well promoted local McDojo or go to an unethical Instructor whose ego has not been humbled. Such Instructors are not able to push their students because they themselves haven’t developed the right kind of character to be able to do this correctly. Pushing a student to test the boundaries of their emotional limits can only really be done if the student has complete and utter trust in his/her Instructor. This kind of trust cannot really be achieved from an Instructor whose motives are distorted and/or ill guided because on a subconscious level this underlying negative influence impedes the students trust and their growth. How can the above two types of Instructor possibly provide the correct type of training coming at it from such distorted perspectives. A lesser trained and less experienced Instructor can still be of a great benefit so by all means go somewhere where the training is easier if that suits but make sure that the Instructor has your interest at heart and not his own. A good Instructor is one who has integrity not necessarily one who has superior knowledge. The most knowledgeable Instructors are undoubtedly the most challenging to train under because their knowledge involves so much dynamic content in each individual technique and so many complex mechanisms for a student to get their head and body around. A good and seasoned Sensei will gradually add the content and complexity into the students Karate so as not to over complicate things. It should be the student’s goal to be able to learn how to hold thought and technique in all its complexity without having any autonomous body parts!! I call this “autonomous karate tourettes” whereby you are practicing a technique, Kata or combination and a stray body part is off doing something completely on its own accord and you have no knowledge of its wild adventure until your instructor pulls you up on it which usually comes as a surprise!!. Students should have the feeling of holding all states of awareness together in a controlled but fluid manner through each transition of movement, giving the techniques mindfulness, intention and accuracy. This brings Karate to life and trains the body and the soul. There has to be love in your art. Love is infinitely detailed and extraordinarily complex in its nature. A student who is putting love into his/her art is able to connect to it on a much deeper level and on those levels learn how to control and hold a complex myriad of thought processes and dynamic physical mechanisms together thus being able to translate this into Karate technique developing power, beauty and expression. Love in the art will help a student through those tough times when it’s hard to carry on. Thoughtful Karate training builds spirit because it is building the psyche (another word for Soul) this is the kind of spirit training that I prefer because building a greater spirit teaches me how to act without conscience and this gives me my peace of mind. Some Instructors perceive hard training as a physical endeavour requiring lots of stamina and body strength which can also be said to build spirit, although I think that this type of training is building a different sense of spirit. Lots of stamina building drills are OK and necessary for sport Karate but if it’s the one hit kill that is being trained for, which I believe to be the fundamental aspect of Shotokan Karate, then it is paramount to have the mindset and the physical power inbuilt, which I believe is attained from training the psyche. My Instructor once told me that conflict was 90% mental and 10% physical so in training the psyche I also have my conflict resolution. Maybe this method of training the psyche suits me because I’m a woman in a male dominated arena and this is how I’ve fashioned my art to be of most benefit to me. Before I start telling you my story, I would like to let you know that I want to remain anonymous. I have been through a lot of sad moments in my life and I don’t want anybody to know who I am. Just because I feel proud of what I have accomplished, and because now I look like I am a normal person, I would like to keep my identity secret. I would prefer to be known for my Karate or something else rather than my own personal story. The reason why I am writing this article now is that I now believe that sharing my story will probably help people who are suffering or have suffered in their lives for some reasons and give them the will to never give up. I used to be a footballer. I have always like watching and playing football. Even if I am now grown up and do not really like all the business that is around this sport, I still support my favourite team with my brother. I started playing at the age of 6. As I was already very lazy at that time and as I hate to run, I chose to be a goalkeeper. Quite a perfect role for me, as I was the last defense wall. My senses and reaction skills were challenged every time the other team came into my penalty area, but I could also rest whenever there were not a lot of actions. I used to be a goalkeeper, and I think I was pretty good at it. But I guess you are wondering why I am talking about football and why I am not talking about Karate straightaway. Well, be patient and please take your time while reading my story. I used to be a goalkeeper…before I had my stroke. A stroke is a brain attack. A stroke happens when the blood supply to a part of the brain is cut off and brain cells are damaged or die. It is a leading cause of adult disability. There are approximately 152,000 strokes in the UK every year. It doesn’t really tell you when it’s going to happen and in which way it is going to affect you. In reality, one in five strokes is fatal. I had a haemorrhagic stroke, which happens when a blood vessel bursts and bleeds into the brain.It happened when I was just 9 years old, in the morning of one of the last days of school in June. When I woke up this day, I didn’t know what was going on. I just knew that I had the worst headache one can ever imagine. Still I had my breakfast, prepared myself and brushed my teeth. Then I went to the living room and I noticed that something was wrong with my balance. I tried to shout some words that I thought were intelligible as I fell onto the floor. My mind was somewhere else, I felt out of time and I was in and out of consciousness, just able to notice that the firemen were taking care of me. When I woke up from a coma in this hospital bed, unable to move or speak, I was just able to moan and cry, unable to understand my situation. Then I was transferred to the rehabilitation centre. There was a time from when I was at the rehabilitation centre when I could not realize what had happened to me. As the left part of my brain has been affected, it is the ‘logic’ area of the brain that enables you to sense the time as past and future (and therefore to be stressed about time), it was the right area of my brain that took control of my mind. It was actually not bad. In the right part of the brain, there is present time and the ability to feel. It was like a way for the brain to protect itself from making me aware of the pain of what had happened. As a consequence this disruption effected the way I was feeling time, it felt like I was in another dimension where time was flying fast and was also easily forgettable. After a few months of rehabilitation, the left side of my brain had recovered a bit and I was able to realise that I was in a very bad situation. Still, I could not understand the words that the doctors used several times to tell me what had happened to me. After all, I was only a 9-year-old child at that time. Because of what happened, I was forced to become left-handed. I can remember that I really hated the fact that I had to change side because I really liked the way I used to write. I really hated that weak situation. But something in me saved me. Something that I had from birth from my parents: A really stubborn character. Try to imagine… these words really had a positive effect on me. I was just 9 when I had this stroke. All I wanted to do was to come back to my former life, to be myself again, surrounded by my family and my good friends from my local school. There was a school at the rehabilitation centre so I not missed anything when I came back to school, and one of my goals was realised: I was having classes with the friends that I had to leave because of the brain operation I’d had and because of the rehabilitation time that followed. I was finally back home full time but as my body had changed so much and as I still needed my parents to help me with most of the things I had to do, I really felt like I was dying. All I used to be, all the habits I used to have, were destroyed to the point that I even thought of killing myself. I was not myself anymore and it was going to be my life, forever. Yes, at that time I was just ten, but a ten-year-old with the mind of someone who is old, with an experience of suffering that nobody around could understand. In terms of sensation, I used to feel a bit lost in my thoughts, probably a consequence of the heavy medication I took. I felt out of time, and to be honest, I still have some troubles to manage my time. The fact that I had a stroke also had an impact on my social life. Even if the speech therapist did a good job, when I came back to the real world, the one in which everybody would assume that you are normal and in which nobody will take time to really take care of you if you do not move or speak as fast as they are moving, I still did not feel at ease when speaking at that time. In this situation, most of the young people would make fun of me or would not care if I had difficulties to speak. This does not help to build confidence. I could notice a slight change in the way my friends were watching me, even if it did not change our bounds in the end. Yes, I was so weak and nothing around me could help me because I still did not have a full understanding of what had happened to me. I did think that it was unfair though. I would be more likely to cry than the boys of my age, crying in despair. I had my family and old friends around me but nobody could understand me, even myself. All I wanted was to look like I was a normal boy, to be respected for what I was inside and not outside. This was the context in which I started karate. At the age of 10, one year after my stroke. In the beginning, it was just a way for me to do an extra school activity. 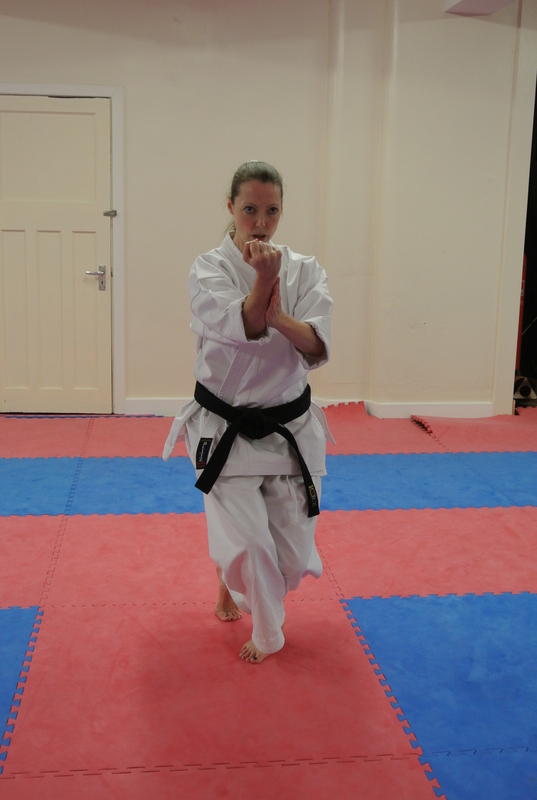 I did see a bit of the main Karate stances such as zenkutsu–dachi for example, in order to stretch my bad right leg, at the rehabilitation centre because one of the physiotherapists was black belt in Shotokan Karate. 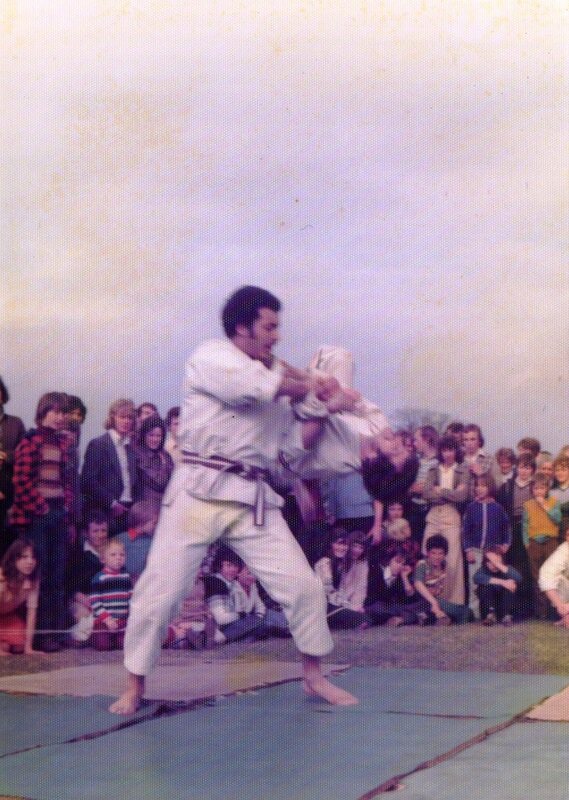 I do not know if this experience was what made my father think that I should start Karate in my home town. I finally joined a club in the end and that teacher was great and humane. I started Karate in a very good environment. However, I had been seeing it as a funny activity for three/four years as I was a bit young when I started. That does not mean that I did not progress at all: I got to green belt at that time. I did not think of starting another ‘sport’. In a way, as I was growing up, my will to forget and to erase my past grew as well (it is quite funny now that I think of it that it is now that I am no longer thinking of it that the my work on myself is the most effective !). At school I had some very bad moments that made me cry. When I was doing Karate I was always happy, even if I did not have the same understanding of it as I do now, and whenever I cried at my club, it was because of the effort that I had to do and because I was making some significant progress. I had always been seen as a weak guy when I was at school. But this was before I started to understand what Karate truly is: it is an art of life. Once you get the mindset that is characteristic of Karate, your life will definitely be different because you will start to think that you do not have any limits anymore. You will discover a true power that is hidden inside: the power of will. If you use it properly, you can get anything in life, as long as it remains something that on which you can have an effect on. Therefore, everything you could not do because of yourself, because you thought ‘No, I can’t do it’ will be possible if you think that you can do it. At the time I began to understand Karate, I had an ‘enemy’ in my school. Or should I say a guy that hated me for some unknown reason. This guy tried his best to prevent my friends from playing with me, without success. He was the kind of guy who is overconfident and needs to show it to people he thought was weak. Bad news for him, I was very strong inside my head. He always provoked me, saying he was going to fight me and win. I was not the weak guy that I was after my stroke anymore. I did not reply to his provocation with violence because it was what he wanted me to do. Instead, I told myself that I would punch him only if he punched me. I spent the year waiting for him to finally dare to attack me, in vain. So after a year in which he tried and failed to ruin my social life, the moment came. We were visiting this beautiful museum in Torino with school. He was behind me in the visitors queue, continuously kicking me in the back. As we are in the museum, I waited until we came outside to let my rage out: too late he tried to attack me again, but this time he was in front of me. Bad luck for him, I launched a very bad mae geri that had the effect of making him fall to the ground slowly but surely. My best friend, who was there during this trip and who did not like what this guy tried to do during the year with me, witnessed the scene. But he chose to prevent me from finishing him in the ground. Whenever we talk now about this story, he says that he should have let me finish him but with time and experience, I think he made the best choice. This guy started to respect me and be nice to me after this ‘fight’. I had what I wanted: peace. I was just 14. And I was not that weak guy anymore. Then about one year from this even, when I was 15, I have been involved in another fight. The other guy was 17. Our school sport class used to be at the same time and we were using the men’s changing room at the same time. Once, I noticed that this guy, taller than me and my comrades, had a lot of fun: he took some of my school mates, kicked them in the feet to make them fall. I could feel that I was next on his list. His muscles were stronger than mine so I could not resist the attack and fell. As he was having his victory over me and showing off to his friends, I was pretty pissed. I then stood up. I took my time. I put myself in front of him, in Zenkutsu Dachi stance, and as I was loading my left arm, I knew my punch was going to go through him. I did the punch and then it hit him in the plexus and I had trouble breathing. He did try to move after but all he could do was insult me. In the end he was sorry and even shook my hand, and that was quite unexpected. I did not know when I did this punch that it was going to be that powerful; this was my first introduction to the power of Karate. Even though I was far from knowing all about it at this time. From this point in time, there was no turning back: I was on a course of constant improvement of myself. In the previous part, I said that I began to understand Karate. It actually took me a long time to understand it fully. What I mean is that Karate is not just a normal sport activity. Doing Karate is not just working on those three mysterious things: technique, Kata and fighting. Karate practice gives you more; I guess it is the same with other martial arts. It really creates a better version of you. First, as you get more and more confident, it will change your body language. I used to be looking down, always walking in a weird way, bent back, and putting most of my balance one my left ― strongest ― side. This was obviously the body language of a weak person, and somehow, my Karate teacher made me aware of that. In every moment at my Karate club, I had to have my back straight, to keep my head high and to care about my balance: this is the posture of a strong person. Then I adopted this posture in my everyday life and I quickly saw the positive results of this change of behaviour: as it is quite an open posture, I have noticed that people were more likely to notice me, to look at me and to feel good in my presence. It actually helped me to get out of the vicious circle of ‘I can’t ‘and to go into the virtuous circle of confidence. I also met good and crazy friends at secondary school that were a very good source of inspiration. In a way, when I was alone fighting myself in the beginning, it took some craziness to think that I would succeed. Those friends were the ‘extra’ craziness that came into my life at the perfect time just when I needed it. However, Karate did not only have a positive effect on my body but also on my mind. My teacher of Karate of that time always said to me ‘You can if you think you can’. Those magic words broke almost all the barriers that I had in my mind that prevented me to be as I wanted to be, to do what I wanted to do. I do not want you to think that the change is direct and that there were not any obstacles. Of course there were some. The key I used to overcome them was to act as if I was confident, even though I was not. I kept telling myself that I was able to do the things that I was not feeling confident enough to do. For instance, even if I recovered most of my speech ability, I still had trouble speaking during any oral examination at school. So for the A-level oral examinations I found the solution: I used a breathing technique that I learnt from my Karate teacher to unblock my voice and to feel confident. The result was that I passed with a good mark. If you want to succeed, you should adopt a way of thinking like people that succeeded before you. I do not believe that those successful people were successful straightaway, without having doubts or thinking of giving up. Those kind of people are a myth and do not exist. This is just a way for some of them to maintain the gap between you and them. This is another point of my story that will be seen further in my article. Thus, even when I was not practicing, Karate kept on having a good influence in my life and it became such a part of my life that I could not escape it. At some point, Karate had become my life and my life had become Karate. Due to my stubborn character and as I hate to lose, I decided to ‘win’ my life in order to feel free and to remain true to myself. In my former club, there was a hidden rule that everybody respected: everybody can learn from each other. The one who had a better understanding of what was being studied would help the one(s) who got lost and did not know what to do. As I got the blue belt, there were a lot of lower grades than mine and I started to enjoy giving a bit of advice, using my own words, to make the other understand what I had already understood about a particular thing of Karate. It could be anything, as long as knew it. I became a model which serves as a basis for lower grades. Well, due to my character and own story, I hate it when I think something is unfair to me. It was not the fault of my teacher at all, but mine. So I changed what had to change and soon got the spirit of a brown belt. I got it six months later. Then I was preparing for the black with my two friends, as I planned. This year, I really was on fire. Unbreakable, both mentally and physically. In the end out of the 3 of us, I was the only one to get the black belt directly while the girl got it entirely at the next exam session and the guy gave up trying to get it. I felt so good. This belt was the proof that if you really work on something with all your strength, you can get it. I was happy and contrary to my comrades, I saw this belt as a beginning, not as the end of something. I was right, because then I came to realise that having the black belt (first Dan) only means that you master the basics of Karate. I am naturally curious, so I just wanted to improve more to see my limits and I did not stop doing karate. During my childhood, I had to go back to hospital several times to check that my brain was okay and developing well. At the age of 16 I have been told by the doctor that a part of the stroke I had was reforming itself, that what I had in my head was like a bomb that could explode at anytime and whose probability to explode would increase by 1% every year. Well, that was a very hard choice but I chose to have a brain operation again, to finally get rid of my past. At least this time, I had time to think about it and to prepare myself for the worst…that did not happen. We agreed with the doctor to wait until I get my A-levels to do the operation. At the age of 19, I had to live again the part of my past that I hated most. I hated the fact that the result of the operation was not predictable. I was going into the unknown.This new operation actually worsened the situation in which I was in. Despite all the Karate training, I had not recovered fully from my stroke. With this new operation, my leg and arm’s situation worsened, even though I could still move them and be able to have some kind of balance that enabled me to stand up. My speech worsened, but I was able to speak, it was just that my speech was very slow and I could lose my words easily as a result of the new operation. I could have a word in my mind but not be able to say it. You might find it a little too harsh but I have always been thinking that the stroke I had was like an experience of death. I died when my stroke happened. The rehabilitation process that followed and Karate were my resurrection. Well, with this operation was like another death. And I needed to resurrect again. As I already had the same kind of experience, it was pretty tough to live it again. However, I was in quite a different situation than before. This time, even if my body was not okay, I had the willpower to push me going more and more forward, higher and higher, something that I owe to Karate practice. The mind is controlling the body, and not the contrary. I hated myself every time I forgot that sort of ‘contract’ with myself. The operation took place about April or May and from June until the end of August; I was at the rehabilitation centre. I actually should have stayed there a bit longer but I really wanted to escape – again! – and to start a university degree so I did not care what the doctor said, and I finally got back to my previous life. There is another part of the story that needs to be told before I go on because it had some repercussion on my life. I will try to make it short. You may think that it is not related but as I was recovering from the operation in the rehabilitation centre, I fell deeply in love with an amazing girl. It was so perfect, I was feeling so good, not noticing that there was anything wrong, maybe because of my lack of experience with girls (yes this is one of the bad things for stroke survivors, we all struggle with our love life). In the end, I felt like I had been stabbed in the back when she broke up with me. Not by the girl, but rather by the circumstances. Actually, I did not know at that time but I was emotionally weak as a consequence of the operation. In terms of feeling, after the new brain operation I had the same side effects as after a stroke. That means that all the pure feelings of love that I had for this lovely girl was strongly increased by the state of my brain at that time. The consequence was that when she broke up with me, I felt like dying. It was my third death and, I hope, the very last one. Therefore, as I was going to start university, I felt completely destroyed inside. However, I was about to discover a very great power: the power of will. I guess that you need to suffer a bit to be able to enjoy your life fully. After this, I swore to myself: ‘I will never be that weak again!’. And this was one of the bases of what happened next and what made me feel that ‘I was myself’ at 20. In this month of September, I was alive but dead inside. The side effects of the new operation were the same as after my stroke. It drove me crazy, because nobody around me could understand. During the months that followed I was quite lonely and full of despair, despite the fact that I made good friends at university. Whenever something was going bad in my life, or not the way I wanted it to be, I could be very angry very easily. That was again due to the brain operation I had. Thus, I had been through a very intense state of depression. I did not have the same problems as I had when I was young. This time they were different, a little bit more serious but in the end it was the same kind of depression. However, this time, I could not afford to have time for that !! At that time I may have lost some of my previous abilities a bit (my balance got worse for example), but there was something that I could not lose: I was first Dan at Karate. Due to my past, I already had the mind of a samurai, I was an experienced warrior who survived several wars. At that time, I was going to be involved into my last one so far, and it was a pretty big one: the war to improve myself. I could not allow myself to be falling into depression again, so I used some tricks to help me. I believe in the power of words. Just a simple thing as to keep on telling myself some positive things such as ‘You are going to be okay’, ‘You’re going to be successful’, ‘You’re strong’, ‘I doesn’t matter what the other say or think about you’, ‘You’re awesome’ and some other phrases that I do not remember now helped me a lot to build the confidence in myself that I had lost. I was not telling myself lies in order to escape reality, it eventually became a reality in the end and I felt so good. I also used Karate as a means to get rid of my anger. Remember, I could be angry about anything very easily. I found a very good way to get rid of it every time a ‘crisis of anger’ happened: I kept it inside me and then I went to my Karate training. Then, I put all of it into my punches and kicks. The results were more effective than what I first thought. As a result, every time I was coming back home after Karate, I felt good, very calm, at peace with myself. The rage I could bear inside of me turned into positive energy. It also made me improve my Karate a lot. This was my revenge against life, and for the very first time in my life I felt that I was happy with myself and in control of my life. I felt very lucky as well to have overcome such much bad things in my life. From this point on my life was mine. It would never be controlled by anyone or anything anymore. True freedom. I was winning against the elements, the demons, god, life itself, or whatever it may be called. And I truly intended to live my life as I intended it to be. One year after the operation, as a consequence of my work on myself, I recovered most of the abilities I had before this second brain operation and I had even improved in comparison to the pre-operation version of me. From this point of time, I started aiming high, and I still am. I started what proved to be a long process: getting rid of all the remaining things that blocked me eventually, and to be honest, I did surprise myself sometimes when I did things that the previous version of myself would have thought to be impossible. I soon realised that in my life, as long as it was in my power, I could do anything that I wanted ! I started to have my own projects of life. I wanted to start Karate competition in my form club. My teacher always said to me that I could do some disable competitions first, in order to introduce me to the world of competition, but I did not agree with her because I thought ‘I don’t care about this kind of competition, I want to win normal competitions !’. I used to think that way. Then, I realised that I could be good for me, a good experience. So I did prepare for this annual disabled Karate competition that took place not far from the area in which I was living. I thought ‘I’m pretty good, I’m going to win everything easily”. Well it was not that easy because I was not the only one in this competition that had problems in my life and so all my opponents had fire in their eyes. I remember a man who was practicing his Katas perfectly, very strong, without any loss of balance. I thought ‘He is so damn good, what is he doing here. Well, as I was watching him in his eyes I could only see his upper body, I did not notice that this man had a plastic leg. He sure was a good source of inspiration. In the end, I lost my three fights due to a lack of experience. I sure was overconfident before this competition. I won my first Kata with my favorite Kata, Empi. After it, a teacher from another club came to talk to me because he was impressed by the jump I did. I did actually jump very high this time ! We had a very inspiring talk. He told me that he saw in my eyes a very high level of concentration and that he saw in me a great potential. I can tell you that it was totally unexpected. However, for the first time in my life, the words of this man made me realise that all the work I had done on myself so far was not in vain and I then felt very good. From this moment, my story and my past had gained recognition. 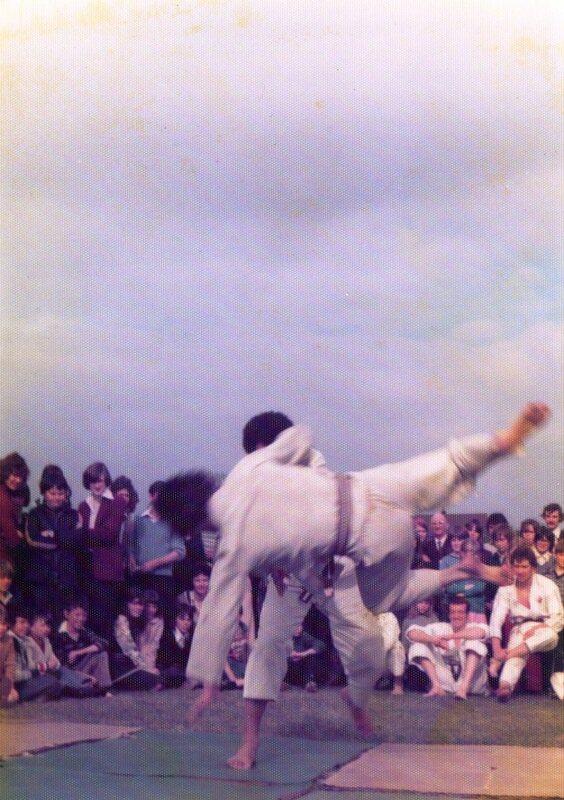 I then lost my second kata to a man whose technique was of a very high level, very impressive. I did think that this man was not disabled at all. In reality, he was even stronger than I expected: he had mental disease. After this competition, I realized that I was only relying on my past and I forgot the real purpose of Karate: Of endless self-improvement. I thought that from this moment that I was going to train as hard as possible. Because my only enemy is myself. I really am my own worst enemy. 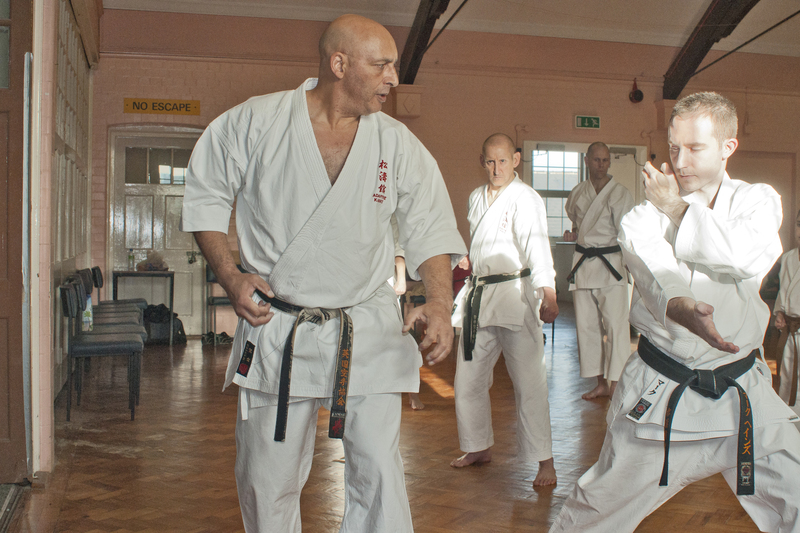 I did participate to another competition earlier this year with sensei John Johnston, a ‘normal’ one. This time, I had time to prepare it. I knew that I had already improved a lot with Sensei. I believed in my capabilities but I remained realistic. I knew that I lacked spirit in the previous competition so as well as the specific body and mind training we did in the club with the other guys, I did train my brain so that my body would accept the violence of the trainings. For instance, I used other mental tricks that I said to myself to unlock the remaining mental barriers that I had. Telling myself some words such as ‘Faster, Faster !’ when I was working on my fights or ‘Do it as a champion would do it’ really helped me to unlock the last few doors locked in my mind and to make full use of my power of will. I was mentally prepared. At the competition, I also discovered that I had a new power: I could see from the eyes of the guys from the other team who was prepared to win and who was not. In the end, I had not been lucky to compete against those who I felt were unprepared. I did a much better version of Empi but I lost my first Kata to a guy who went to the finals and who turned out to be a European champion. My job was done, we were not in the same category but I was fascinated. ‘What makes you become a champion ?’ I was not feeling jealous but I felt very curious and I wanted to know how it was to be a champion. ‘How can I reach this level ?’ I was still lost in my thought when I also lost my fight. However, I started to think in a more practical way about the losses of that day. I actually won a lot by losing this time. I was asking myself ‘Why do you lose ? you felt very prepared for this one’. And then the answer was inside of me. Yes I was mentally prepared to win everything this time but something lacked to make it happen. To be honest, I have got a bigger left side than my right side. To make you understand, I am like the Rafael Nadal of Karate in terms of body. I had always been thinking negatively about my right side, as if all the reason of the sad things that happened to me in my past was because of it. After this competition, I told my right side that it was not its fault if I lost on that day. I told it that I wanted to become an ally with it, that I was no longer considering it as my bad side because it bears the solution within itself. And then in my head, everything was clear: now that I had the mentality to do anything, I needed the physical to be able to reach my goals. So I started going to the gym and asked for a program of specific improvement for my weaker side that will, I believe, not be weak anymore in a few years !This competition really helped me to know that I had no limits, I was just limiting myself. I really want to become a champion one day and my dream is to be a champion in the ‘normal’ tournaments. I will do everything in my power to reach this goal, not to be the winner, but rather as a way to improve myself and to be okay with myself. I won’t accept anymore to be prisoner of the dictatorship of my body. Because I still have fewer muscles in my right side, it is still weak. I cannot accept it anymore so I will do everything to improve it and to finally reach this goal. I just need a strong body now. With a strong mind and a strong body, I will be unstoppable. I am going to stop here because I could also write pages about my other life projects. However, I would like to let you know that I have been improving them with the same unbreakable spirit. Those 3 last years have been the best in my life so far because I felt so alive trying to make my projects a reality. I would like this article to inspire other people. Because, yes, there is a life after stroke. Even more than that, I believe this article could inspire other people, whether disabled or not, or practicing another martial art, it does not really matter because life strikes us and will keep on trying to bring us down in an equal way. I would be glad if my story inspires others to fight themselves. Therefore, I would like my message to be universal, not only limited to stroke survivors but rather to be for everyone. You can change yourself and reach your goals. Dream big. When I say that Karate changed my life, I really mean it but this is my thing, you are not required to start practicing Karate. If you are having problems in your life, start searching for solutions, for activities that would make yourself better. Then when you find it, give all you have got into it. Do not change yourself entirely but rather improve yourself. Accept yourself the way you are, do not lie to yourself. Be true to yourself. If not, you will keep on making mistakes. You are the only one to make most of the choices in your life. Think positive as well, it is the key to everything. Then, if you make some mistakes, you will be able to react in an appropriate way and to move on quickly. So many people are stuck in their past life. As a consequence they cannot live in the present that is dark because of their perception and they will find no solution because they do not see any future. The solution is within you. You have to change your perception. It took me almost ten years to accept the fact that I had a stroke, I wanted to forget everything that happened to me. But it was impossible because my stroke was the starting point of my life. From that moment of my life, I made some bad choices that had so much impact on me that I cannot undo them. However, as I am living in the present, I can change the future and make this thing of the past not be something that has effects on my present anymore. Now every time someone tells me to go easy on my body, even if it’s just to be nice with me, I reply : ‘I still haven’t found my limits so I won’t stop until I find them !’To be honest, I have done so much and lived half my life with an after-stroke body that I am quite afraid of the kind of person I would have become if I did not have my stroke. If I managed to take the best out of that life-changing event, then anybody can change their life ! I still cannot believe what I have done because I am of a very lazy nature.To conclude, I would say that the only way to free yourself is to fight yourself . You should see every problem of your life as a challenge to overcome. Try your best to change things that you can change (mentally and physically). Wage a war against yourself. And win. PS: I ‘m serious about keeping my identity secret. So, for some of you who know me in real life, please don’t mention my name in the comment section below or on Facebook. Cheers!